If you want to try out performing arts training or to top up your skills, consider a short course. 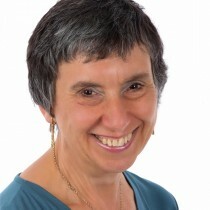 About 40 years ago, someone came up with the idea of offering short, intensive training – mostly in the traditional summer holiday months but also at Easter – for actors wanting to develop skills or acquire new ones, for children hungry for more training and for almost anyone, including amateurs and irrespective of age, wanting to dip a toe into relatively affordable performing arts waters. The idea has caught on. Almost every stage and drama school now offers summer classes or a range of them at different levels. Some are quite generally focused and others are very specific. And many other organisations such as performing arts venues, stage schools, youth theatre providers and so on offer them too. 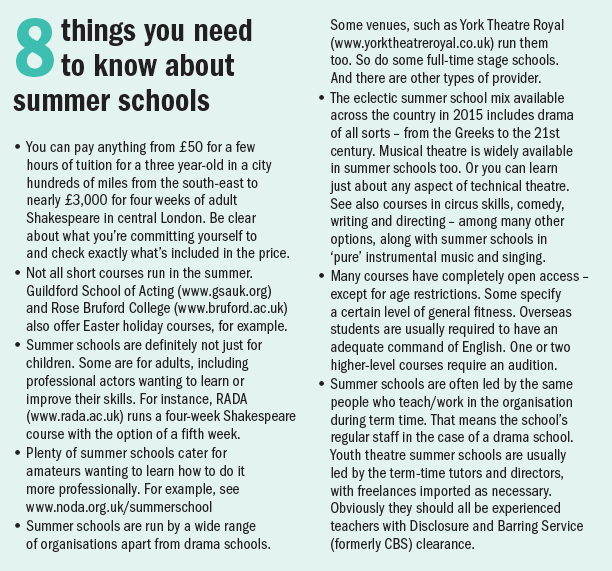 This is the 17th annual summer schools feature I have written for The Stage, and the growth in the range of opportunities during that time is remarkable. For instance, courses in backstage work are ever more prominent, as are performance-based classes. This is encouraging, given the job opportunities and skills shortages in some non-performance areas. The Guildhall School of Music and Drama, for example, has no fewer than 10 new summer schools this year, making a total of 28, although some of those relate to pure music rather than wider performing arts. New courses include drama for ages 16-17, costume for stage and screen, practical theatre sound, stage management and hair and make-up. Mountview Academy of Theatre Arts meanwhile has added short summer courses in wardrobe and stage management for amateurs to its already extensive provision. And Joanna Read, principal of LAMDA, told me recently that once its £16 million new building is open next year there are plans to offer more summer schools. Yes, of course, summer schools are lucrative for many of these providers and are a useful business to supplement what they do for the rest of the year. But the expansion is good news for the purchasers of this training too because it ensures such a wealth of choice. theatre, so I did my first under-16 summer school at Mountview in 2007 and then went back for more in 2010 and 2014, as well as doing Saturday school there. 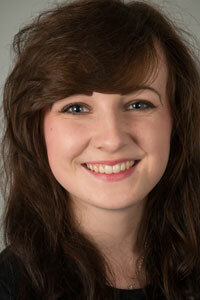 It has certainly helped me to work out what I want to do professionally,” she says. Rahim and McCluskie both attended their first summer schools as children and there is, as ever, a terrific range of summer schools for under 16s. For instance, Pauline Quirke Academy branches run summer schools in Leicester, Milton Keynes, Hertford, Rochester, Tonbridge and Tunbridge Wells. Details of times and curriculums vary. Some of these cater, in different groups, for the youngest children, aged three to six, as well as seven to 18 year-olds. For another example, take the highly esteemed full-time Sylvia Young Theatre School. It also runs two one-week good, popular holiday courses in its spacious building off Edgware Road in London. The two options are music theatre and theatre skills. Each course is run more than once in different weeks with teaching by the school’s regular staff. Outside London, options include the Poole-based Dorset School of Acting, which this summer is offering two concurrent summer schools for ages eight-13 and 14-21 with the aim of mounting a production of Grease in a week. Theatre Royal, Newcastle is busy engaging children this summer too with play-in-a-week options for ages five to seven, eight to 11 and 12 to 16, as well as a five-day film challenge, musical theatre for ages 11-15 and other courses. So it really doesn’t matter how old you are, whether or not you have any performance experience or how far along your career path you are. If you want to work hard, enjoy yourself, assess your own ambition and potential and learn a lot, apply for a summer school. “It is just fantastic to spend a week or two with like-minded people and be taught by inspirational staff,” says Rahim.